A no-carbs eating plan is an extreme version of the low-carb aspect of the Atkins diet. Weight loss can be significant if carbohydrates are absent from the diet. However, any weight loss is likely to be short term as such a restrictive diet is extremely difficult to sustain in the long term. Seek the advice of your physician before undergoing a restrictive diet. Carbohydrates are the body's main energy source. They comprise sugars, starch and fiber. Sugars such as fructose in fruit and sugars in refined carbohydrates such as candies, cakes and doughnuts provide quick energy. Starch found in complex carbohydrates such as potatoes, oats and rice provide sustained energy. Fiber is found in fruits, vegetables, lentils and whole grains such as wheat bran, oats and brown rice. Excessive carbohydrates in the diet, particularly refined carbohydrates, can cause the body to store the excess energy as fat. 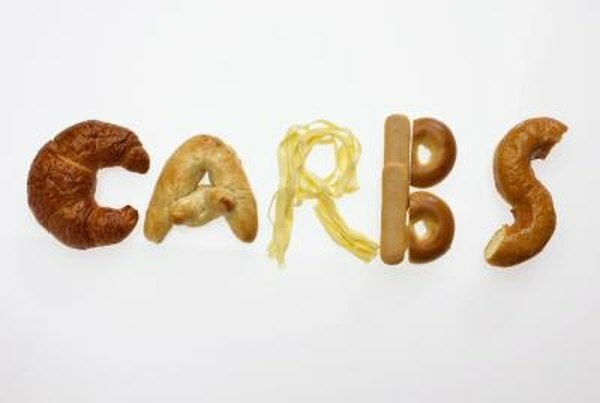 A no-carbs eating plan necessitates a total lack of all carbohydrates in the diet. Your calories are derived from an increased intake of protein and fats from red meat, offal meats such as liver and kidney, whole eggs, poultry and fish. It is difficult to quantify how much weight you would lose on a no-carbs diet. That would depend on a number of factors, such as your metabolism and the amount of exercise you do. A 2003 study by the University of Cincinnati and Children's Hospital Medical Center reported in the "Journal of Clinical Endocrinology and Metabolism" found that a very low carbohydrate diet is more effective for short-term weight loss than a low-fat diet. A no-carbs diet deprives your body of valuable nutrients and compromises your health. Cutting out carbs may help you lose weight in the short term, but it will have little effect on your body composition, nor will it keep the weight off in the long term. Such a diet will not help you maintain a healthy, lean toned body, which keeps your metabolism high and ensures permanent weight loss. To ensure permanent weight loss, eat a nutritious diet that does not exceed your caloric needs and do regular exercise. Your diet may include limiting your carbohydrate intake to complex carbs such as whole grains, sweet potatoes, fruits and vegetables, which provide energy, fiber, vitamins and minerals. A lack of carbohydrates in the diet can lead to ketosis, which occurs when ketones accumulate in the body. Ketones are acidic chemicals released when the body primarily metabolizes fat as energy instead of carbohydrates. According to Vanderbilt University, increased ketone levels lead to the body secreting more water and salt, which accounts for most of the weight lost in a no-carb or extreme low-carb diet. Ketosis results in sluggishness, gas, constipation and low energy levels. An accumulation of ketones also increases the acidity of the blood, which affects the urine and may damage your liver and kidneys, according to NHS Inform.